There is a lot that Scandinavia can learn from Canada in matters of immigration and integration. Scandinavia is attaining popularity in the world today and is an exemplary model for other countries. Canada serves as an inspiration to the countries located in the region. It can help to deal with the challenges of ethnic diversity and increased immigration. The world thinks high about Scandinavia. There is an impression that Denmark, Sweden, and Norway are a rich blend of economic growth and private capitalism. They have the features of social equity and state intervention. Observers across the world note that social welfare and economic efficiency in Scandinavian countries reinforce each other. The region has high rankings consistently in the international indices regarding happiness and competitiveness. Likewise, the world can learn a lot from Scandinavia. This model has received considerable attention in Canada. Many politicians, Academics, journalists, leaders, NGOs suggest Scandinavian solutions to the challenges faced by Canada and the world. Scandinavia has positive features like proportional representation, good voter turnout, gender equality, coalition governments, quality education, top class environment and energy policy, several welfare provisions and an ideal health-care delivery strategy. It has an excellent record in conflict resolution and international humanitarianism. 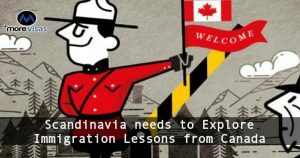 In the field of pursuing policies on immigration and integration, Canadian policies are emulated by Scandinavia. As novices, Denmark, Sweden, and Norway are relatively new to immigration and are on the lookout for inspiration and solutions. For them the model of Canada is attractive. Uniquely, it has played an important role in the reformation process of the region in the present century. Canada has a positive view of immigrants and regards them as a resource, which has greatly inspired fresh attitudes towards labor immigration in Scandinavia. Canada has a focus on skilled economic immigrants, which integrates well and easily in the labor market. This serves as an alternative to humanitarian and family immigrants. The three Scandinavian countries have not emulated the Canadian policies totally. The immigration has differed from the Canadian initiatives and policies. They have been adapted based on the domestic compulsions in a practical manner. In the first place, there is a Canadian emphasis on integration of the immigrants personally into the labor market. This fact resonates in Scandinavia. It lays emphasis on activating the transfer of responsibility to social service users to play an effective role in society. The adoption of citizenship ceremonies by Norway and the points system for economic immigrants seen in Denmark are inspired by Canada. The model of Canada has played a major role in Sweden for accepting the dual citizenship. Again, the Canadian model is relevant to Scandinavia because it shows that the Canadian model in a good light. It is the result of some unique geographic circumstances and socio-political causes and is based on the size of the country, its long history of immigration, assimilation, and adoption of multiculturalism. At the same time, the countries of Scandinavia are different from Canada but nevertheless, the Canadian model is relevant for them. In Scandinavia, Canada enjoys a status as a top international immigration model. Above all, it is no longer a policy borrower but has become a policy lender also. The active promotion of the model taken up and pursued by the federal governments has succeeded well. It is regarded as an international leader in matters of integration and immigration and effectively promotes the interests and values of Canada at the international stage. As a matter of fact, the future and relevance of this model throughout the world largely depend on a practical adaptation. Together with the changing circumstances, it will continue to show benefits to the country as well as the immigrants.